Initially introduced in China back in July, the Nokia X5 was later made available across the globe under a different name – Nokia 5.1 Plus. Now HMD Global, the Finnish company behind Nokia smartphones, announced two new Nokia 5.1 Plus variants will be launched on the market in just a few days. 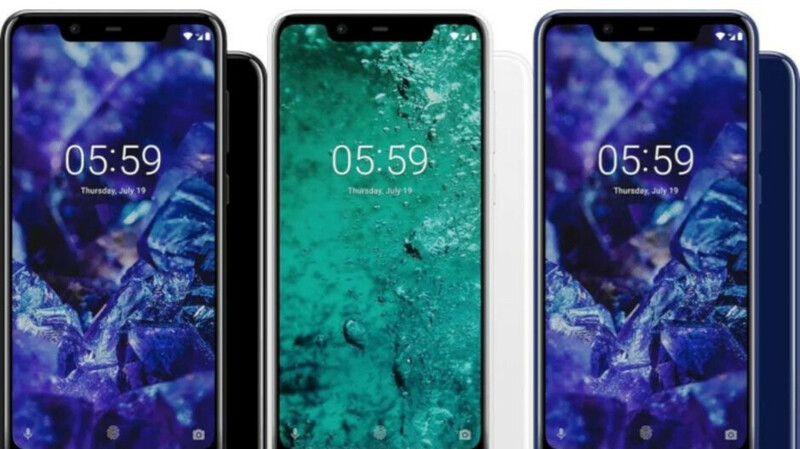 The new Nokia 5.1 Plus phones will pack more memory than the original model, which comes with 3GB RAM and 32GB internal storage. Starting February 7, the enhanced Nokia 5.1 Plus models will be available for purchase online, while brick and mortar stores will get them on February 12, but only in India for now. The cheapest of the two will feature 4GB RAM and 64GB storage, and it will sell for around $200, while the expensive one will come with 6GB RAM and 64GB internal memory, but it will cost $230. We expect these prices to be higher in Europe due to VAT and other taxes, but not by much. Aside from the amount of memory, there are no other differences between the base Nokia 5.1 Plus model and the new ones. With those prices, its now priced equal to nokia 6.1 plus which makes no sense at all. Honestly, a lot of the decisions Nokia has been making recently doesn't make any sense. Those decisions have led HMD to be #9 on the global smartphone list. #10 in the tough to crack region of China, a top 5 brand in Europe, and the fastest growing smartphone OEM in the last two quarters. I’d say their decisions have been very beneficial for them and make a lot of sense. Short term gains from a short-term strategy isn't sustainable. Just because they are top in a few lists, all credibility withstanding, doesn't mean that they are exempt from criticism and from overexposure. Just look at LG and HTC. Those gains were over the course of two years, and they are still growing. Now they've adapted said strategy to allow for gains in markets that they have little exposure in, like the U.S. They are in the global smartphone top 10. Just because you may not like the fact that they are doing well, which is all credible and verifiable facts, doesn't mean that their methods warrant criticism, especially since their strategy has yielded extremely positive results. Two years is short term in this case. Just because their strategy is working now doesn't mean that they are exempt from making mistakes or criticism from baffling decisions. I understand that you want to give them a free pass and all. Two years and counting. HMD has also adjusted their strategy, as I mentioned. The facts are in their favor, but I do know that you want to find any reason to tear HMD down, even when there currently are none. I'm having a hard time understanding why Nokia doesn't just streamline their phone releases. This just makes things more complicated imo. And I don't get why OEMs can't just do this from the start. Stop with the fragmented releases when it comes to storage differences in devices. I agree, they make so many low end phones which are just not usable. The nokia 1 has a 480 display, 1gb of ram and 8gb of storage, the Nokia 3 is not much better. The Nokia 7.1, Nokia 7 plus sorroco and the Nokia 8 are their best efforts so far. They wouldn’t be usable for whom? Low end Android smartphones sell much more than high end or even midrange ones. People across the globe use them on a consistent basis, and are happy with them, or they wouldn’t sell as much as they do. Not everyone has the means to purchase something better, especially in markets that are not as financially well off as others, and these low end smartphones are also known for their endurance and longevity, which is much more of a necessity than better specs due to the conditions of these regions. I agree. 8GB of storage with a gig of RAM is unacceptable in 2019. That's ridiculously low even for food stamp phone standards. I definitely think the 7 Plus is a great phone that I wish came to the US with "proper" band support. It's not unacceptable if priced right for the markets that they are in. Whether you choose to accept it or not, low end smartphones like that do serve a purpose. It is if it's 2019. Just because it's a foodstamp phone doesn't mean that it has to be limited to paltry storage and RAM. Maybe you should stop trying to be so aggressive about it. The year has nothing to do with the fact that it’s an ultra low end smartphone and it won’t have the bells and whistles. It has the storage that it has to keep the cost down. That’s obvious. Maybe YOU shouldn’t be so aggressive about wanting to complain for the sake of complaining. While some seem to have a problem understanding why OEM’s like HMD and others have staggered releases of smartphones with different storage options, it’s pretty obvious to me: regional demand. Some regions like China have consumers that are fine with lesser storage options, while in India, the higher storage options are what seems to be what consumers demand there. The other reason is,of course, the financial reasons. Businesses pretty much know if they can release various variants of the same smartphone in certain regions to increase their profits. It’s obvious that consumers in these regions are going to buy them, which is why they do it. As long as there is money to be made and the actual consumers are willing to buy it, OEM’s are going to do it. Most of the consumers in the market for these smartphones will have no complaints about this tactic, while those that have no intention of buying them in the first place will complain for the sake of complaining. India and China aren't the only markets that use smartphones btw. You keep comparing strategies to those markets and that doesn't really make sense when Nokia has markets in other countries as well like the UK and a few other European countries. Last time I checked, those weren't developing countries. You can't apply that example to every scenario. Nowhere did I imply nor state that they are the only markets that use smartphones. Do not try and incorrectly say otherwise. Those markets were used as an example because HMD usually releases their smartphones in those markets first. That's a verifiable fact, so it does make sense, whether you understand it or not. Those are the #'s 1 and 2 markets for smartphones. I also never said nor implied that this same strategy can be applied to every market. HMD has successfully been able to adjust strategies for varying markets. This is also a verifiable fact, and their continued growth is a testament to it. But you continue to toss them out there implying that they are. They are not the only markets Nokia caters to. They also cater to the EU market as well. The fact that you are backed into a corner and trying to move the goalpost back just further proves my point. But you continue to namedrop them each and every time almost. I’m not implying anything. That’s obvious by the fact that you can’t provide a link proving so. You’re just falsely assuming that I’m implying that. I never claimed they are the only markets HMD caters to. You are just trying to change the facts to suit your false narrative because you’re backed into a corner by your lack of proof. But do continue to manufacture reasons to pick fights with me simply because I used the two largest smartphone markets as an example. The unibrow is very dated design at this point. I know this is a lower end phone but there's far better design options ot there especially if you're going to have a massive chin.